Faced with an awkwardly sized staircase landing, this blogger transformed what had become a "drop spot" into a real destination. Update a 114-year-old, 1,200-square-foot Dutch Colonial to meet the needs of a young family? Challenge accepted, said lifestyle blogger Tabatha Muntizinger. But she would do it, in her own words, “without sacrificing any fun or creativity.” With two children and seven pets, Muntzinger—the creative force behind Turn Right at Lake Michigan—decorates in a style that both celebrates and is honest about life as it’s lived in under her roof. Earlier this year, when she set out to redecorate a staircase landing, she eschewed the more formal sitting area for a cozy, family-friendly reading nook. This time of year, we can’t help but dwell on the design details that make a house a home, so we asked Muntzinger for details on how the project came together. 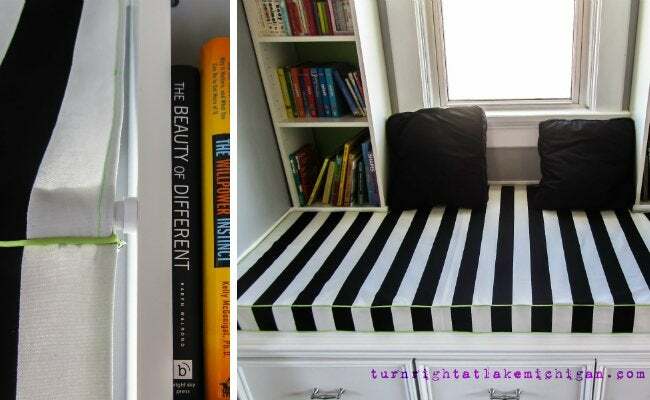 The reading nook fits so snugly into a landing at the top of your stairs. What had been there before? The space at the top of the stairs was the result of a dormer window. It was incredibly deep—big enough for a twin bed, for sure—but… there wasn’t much purpose for it. For the longest time, we had filled it with some side chairs and a small end table. But over time it just became a really fancy place to leave random things. And then later you’d return to find a cat sleeping on top of those random things. Why build a window seat? When we bought the house, I had always envisioned a window seat in the space. I’ve been in love with the idea of one since I was a kid. At one point, my parents toured a house with a window seat, and they didn’t end up buying the house, but I can still remember what it felt like to curl up and feel the sun shine on me. As our family grew, I realized the landing should be functional for all us. The idea for the nook was that it would become a communal space where I could sit and share my love of reading with my kids in a fun yet practical way. Did the project involve learning any new skills? I’d certainly never cut up a mattress before or sewn a custom-shaped cover for one…. 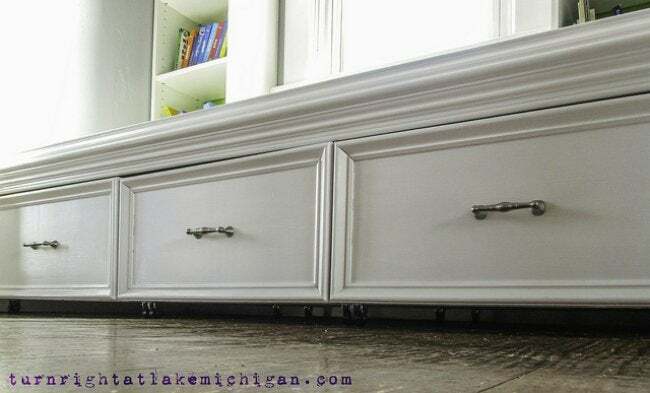 And this was actually our first foray into using some of Ana White’s DIY plans. 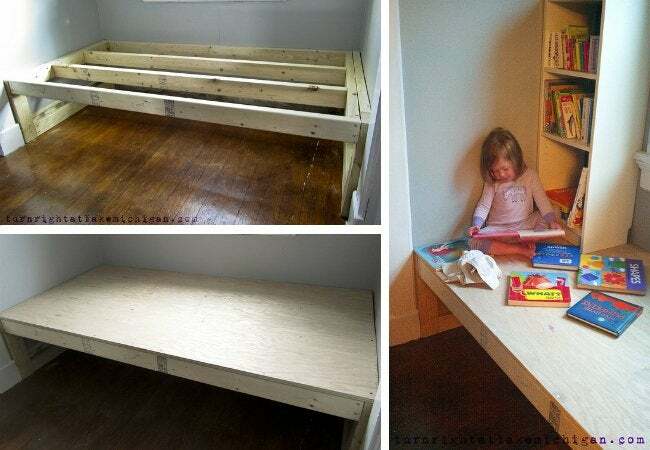 To build the reading nook, we actually modified her instructions for making a storage daybed. So many clever ideas went into this. Which aspect are you most proud of? Probably the cushion. The challenge was to come up with a seating solution which wouldn’t need constant readjustment and which would be comfortable for up to four people. So I started with the cheapest foam mattress sold by IKEA (it was far cheaper than upholstery foam). After cutting it down to size, the next step was to design a cover that would look good but still be completely washable—because, hi, small children and multiple pets. This was the first time I’d sewn something that I’d completely made up in my head. Luckily, it all turned out so much better than I’d hoped. What advice would you share with someone who wants to make something similar? Measure twice, cut once! Also, you’ll probably want a cushion that’s twice as thick as the one you start out thinking would be sufficient. 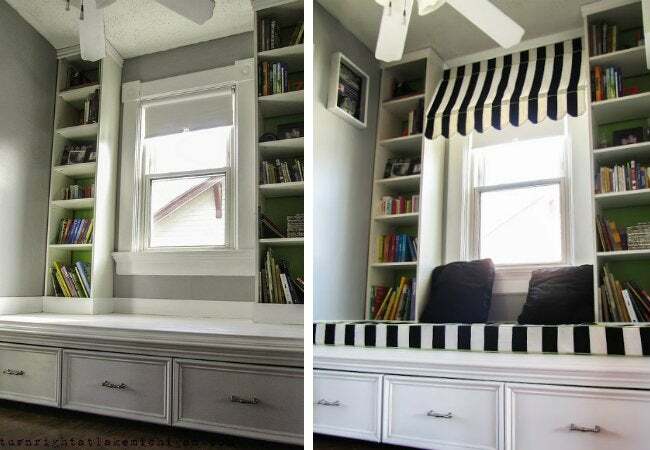 What do you enjoy most about the reading nook? Finding my kids curled up on it, on their own, reading from their “library.” That’s exactly what I’d hoped for—to create a fun, practical space for them to fall in love with books and build their imaginations. 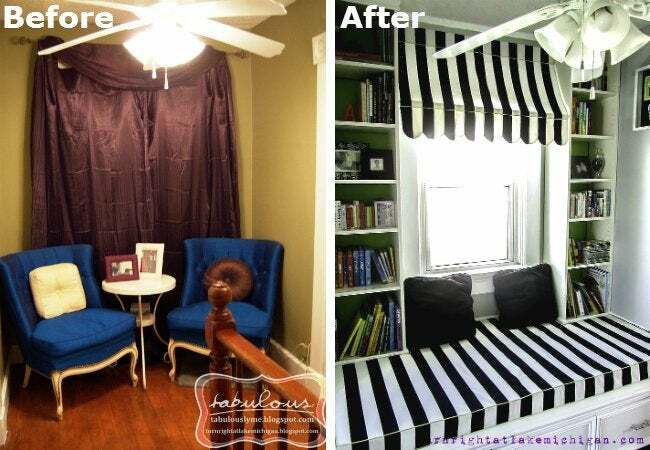 How has this makeover changed how your family uses the space? It’s not just a catchall anymore; it’s truly a gathering place for the family, as we go through the routines of our days. I sit there to braid hair and help brush teeth and fold laundry. I sometimes even sneak there myself, after bedtime, to write blog posts or read. It’s also pretty safe to say that the animals all enjoy it, too. All in all, the window seat has become a wonderful communal space for everyone to lounge and enjoy the simple things—like, each other. Plus, whereas we used to shove linens wherever they’d fit, we now have fantastic storage for extra pillows, bed sheets, and spare blankets.